Wonderland Productions provides tax credit expertise for production companies shooting commercials in New Orleans, Louisiana and the Gulf Coast. Wonderland enables commercial production projects to access the dramatic savings of Louisiana Film Tax Credits. Taking advantage of film tax credits is easy with Wonderland -- we have the structure and experience to ensure the project receives Louisiana Film Tax Credits. Wonderland does all of the work so the production company can focus on the commercial and still recieve the tax credit. Commercials shot in Louisiana with budgets over $300,000 qualify for the Louisiana Film Tax Credit of 30%. The film tax credit is “transferable”, that is, it can be sold. This is an important feature of the film tax credit since most commercial production companies do not have Louisiana tax liability. 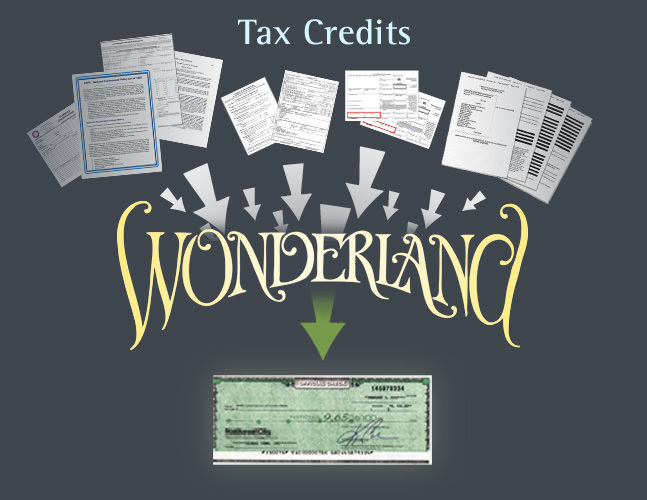 Once the tax credit has been certified, and Wonderland does all the work to make sure the project is certified by the state so the tax credit can be sold to either the state or to a private party or entity with Louisiana tax liability. Wonderland makes that happen, knowing who buys tax credits and for how much. (Generally the tax credits are sold for 80-85 cents on the dollar. WONDERLAND TAKES CARE OF THE DETAILS. We have established companies with seperate bank accounts, certified to be in good standing by the Secretary of State, which act in coordination to receive the tax credit for the commercial. One company is the “Investor Company” which finances the commercial. The second is the “production expense” company responsible for all expenditures associated with the production, from start to finish. Our payroll accounting complies with all federal and state laws, and we handle all necessary deductions for health and welfare, pension, union dues, etc. We provide workers compensation insurance coverage, as well as liability coverage for all aspects of the commercial production. Wonderland obtains the neccessary pre-certification required of commercial productions to begin the process of qualifying for the film tax credit. Our pre-production activity and expenditures all meet Louisiana film tax credit law in order to receive the commercial film tax credit. Wonderland handles all equipment rentals (in and out of state) in a manner that complies with Louisiana film tax credit law to ensure the commercial tax credit. Our production documentation workflow fully complies with Louisiana film tax credit law to ensure tax credits are awarded for the project. Wonderland ensures the project recieves final certification from a CPA auditor before submission to the state for the award of the commercial film tax credit.